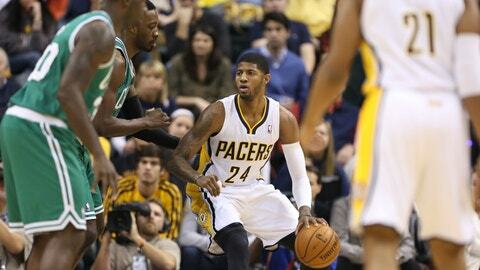 Paul George's 24 points helped lead the Pacers to a big win over Boston. INDIANAPOLIS — Lance Stephenson wiggled his hips after a nasty crossover move. Paul George gestured to the crowd with his shooting eye and Danny Granger showed everyone he still has the touch. "We’re starting the game off with high energy and we’re ending the game with high energy and in between we’re maintaining that energy," George said. "It wears teams down, and I think that’s been the case these past couple games." "Adding Granger is scary," Stevens said. "I think the more comfortable he gets, the better they’ll be. I think they’re already if not the leader for the hunt, they’re in the hunt." "We are a tough basketball team, we know that we can play, we know that we can improve," George said. "We are having fun out there because we are getting to know each other better." "He’s such a gifted passer and playmaker, he gives us a real edge," Vogel said. "We’re not a team to make excuses," Jared Sullinger said. "Indiana just came out and kicked our behind. We just have to play better."